A fishing cat's short, stocky body is tailor made for hunting in the water. Making a splash: Cats don’t like water, and they definitely don’t swim, right? Well, that’s only true of some cats—others actually love the water! Fishing cats are one of the best swimmers around and are completely at home in the water. Cats are supposed to roam the land while hunting small terrestrial animals, but sometimes you want to be something different! If you were to look at the fishing cat without knowing what it is, you would not guess that with its short, stocky body it could swim like a pro. The fishing cat’s paws have webbing between the toes to help it swim and walk in muddy wetlands without sinking. The cat’s tail is fairly short, less than half of its body length, and its coat is olive-gray with black spots and stripes. The fishing cat’s fur has two layers: one layer is very short and dense to keep the cat’s skin warm and dry during time spent in the water; longer hairs, called guard hairs, give the cat its color pattern, which is great for camouflage. Female fishing cats are much smaller than the males. A fishing cat moves carefully through marsh reeds. Fishing cats are attracted to all types of water and live in wetlands, their most common stomping ground, with marshes, swamps, and mangroves also high on the list of suitable habitat. They are sometimes found in tropical dry forests and have even been seen in the Indian Himalayas, at elevations of 4,900 feet (1,500 meters) in dense vegetation near rivers and streams. Little is known about fishing cats in the wild, but it is thought that they have no natural predators, other than humans. Fishing cats mainly eat fish but also dine on other prey found in the water, including crabs, crayfish, and frogs. Of course, they don’t use a fishing pole! Instead, the cats wade in shallow water and use their paws to scoop fish out of the water, or they dive headfirst into deeper areas to catch a meal with their teeth. The cats have also been seen eating snakes, rodents, young deer, and wild pigs and ducks. Farmers’ chickens, dogs, goats, and calves are fair game for the fishing cat, as are leftovers from someone else’s meal, including morsels tigers leave behind after they’ve eaten their fill. These un-finicky felines are willing to eat any time of the day, which gives them more menu choices. At the San Diego Zoo, the fishing cats are offered, on various days of the week, thawed trout and smelt, mice, cat kibble, a cow knuckle bone, and a fortified meat-based commercial carnivore diet. One day a week is fishing day, and the cats have live goldfish, carp, or tilapia added to their pool. Like many smaller felines, fishing cats communicate with hisses, guttural growls, and even a low, demanding meow. A male and female make a sound called chittering as part of their courtship, with the female signaling her willingness to breed and the male communicating submissiveness. Fishing cats mark their territory and breeding status with their strong-smelling urine. If it has been a good rainy season, the food should be plentiful. And if it is warm and sunny, fishing cat kittens have a better chance of being healthy. Fishing cat females give birth in the spring to an average of two kittens in a litter. They raise their young without help from the male; he doesn’t stay around once breeding time is over. The kittens learn to fish by watching their mother. At 10 months, the young fishing cats are ready to venture out on their own. A single fishing cat came to the San Diego Zoo in 1961 from Bangkok, but it passed away the same year. In 1986, we received a pair as part of a breeding loan from the Royal Rotterdam Zoo in the Netherlands. The pair was successful, with kittens born that same year! More fishing cats arrived from Burma and the Cincinnati Zoo for breeding purposes, with most of the offspring going to the Singapore Zoo. In 1996, keepers raised a trio of kittens in our nursery facility after their mother rejected them. In the wild, the kittens would have learned to fish by watching their mother, so our nursery keepers took on the task! At first, the kittens were fascinated by the fish swimming in a shallow wading pool. They took to the water like pros and jumped in after the fish, darting after the quick movements, but they weren’t sure how to catch them. Their keeper reassured them and picked up the fish herself, showing it to them and letting them smell it. The cats instinctively bit at the fish and then began batting at them in the water with their paws. It didn’t take long before they were scooping up the minnows, throwing them out of the pool, and eating them, just like their wild counterparts do. To date, we have had a total of 34 fishing cats born at the San Diego Zoo over the years. The fishing cat exhibit along Tiger Trail simulates native Asian habitat and provides the cats with running water and ample cover. Fishing cats depend on water in their habitat, but this is likely to cause trouble for future generations. It has been estimated that about 50 percent of Southeast Asia wetlands are disappearing as the human population grows. These wetland areas are affected by pollution, over-farming and the use of chemical fertilizers at farms that drain into wetlands, over-fishing by humans, and drainage issues. Fishing cats do not need to live near water but always choose to make their home there. This choice may not be the best but appears to be what the fishing cat prefers. 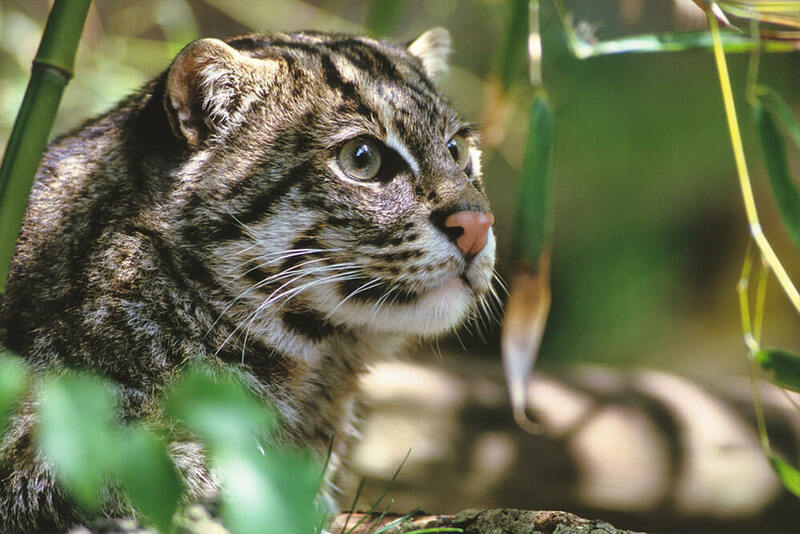 Choosing to purchase products that support better use of the land is a great way to help fishing cats and other species that live in wetland habitats. Reducing pollution and using eco-friendly fishing and agricultural ideas may ensure that fishing cats always have their favorite place to call home, right on the banks of a wetland area. The Association of Zoos and Aquariums manages a Species Survival Plan for fishing cats, of which the San Diego Zoo is a part. You can help us bring fishing cats and other felines back from the brink by supporting the San Diego Zoo Global Wildlife Conservancy. Together we can save and protect wildlife around the globe. Fishing cats have been seen swimming underwater to grab a duck’s legs. If you think fishing cats look cute and cuddly, think again—these small cats can be very aggressive. Ever tried to sneak up on a cat? A cat’s ear has 32 muscles in it and can rotate almost a full 180 degrees, so the cat can hear in several directions without turning its head.